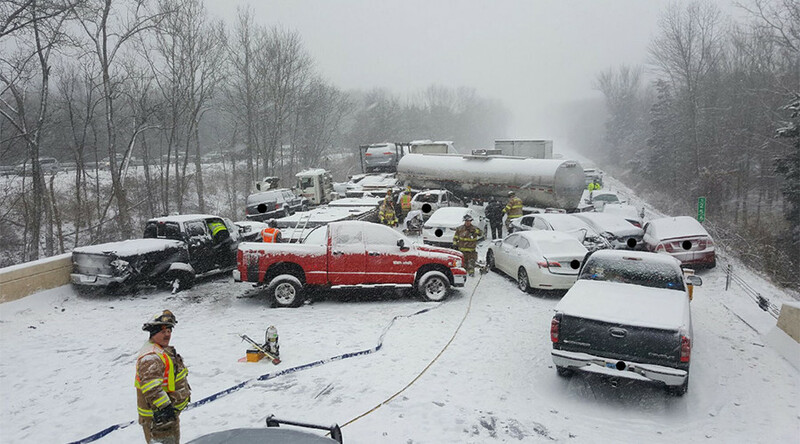 Connecticut State Police have shared footage from the scene of a multi-vehicle pile up involving at least 20 cars, three tractor trailers and a tanker which occurred amidst severe winter weather conditions. The smash which occurred in Middletown, Connecticut, Friday afternoon, has resulted in the closure of the Interstate 91 in both directions. Connecticut State Police have shared photos and videos of a multi-vehicle smash resulting in the closure of Interstate 91 in both directions. No serious injuries have been reported, according to police. 21 vehicle pileup w 3 trucks and two ruptured fuel tanks on I-91s. Highway shut down and up to 10 injuries. Stay home if possible. Thanks. Troopers are dealing with reports of several crashes in the region as severe weather hampers driving conditions. A winter storm warning is in place for Middletown, Connecticut and drivers are being advised to take extra caution on the roads with 12 inch snowfalls being forecast.